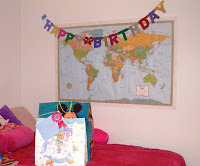 The little one decorated her girly bedroom for a simple birthday party for the main man in her life. She did all the 'decorating' herself because mommy was busy doing her chores around the house. We were supposed to do it tonight but since Daddy went to the other house to fix some leak on the roof, I decided to do it yesterday evening. It was easier to go about things knowing he won't be walking in on us while doing some preps. The little one really got busy. She pulled out all her paraphernalia. She has a "bag of tricks" for times like this and it really makes her very excited to do it. She was pulling one of our 2 step stools around her bedroom so she could hang stuff around up the walls and even tried putting something on the ceiling fan. She was quite disappointed though because she ran out of balloons and she wasn't able to tell us. Balloons to her are the 'life' of the party but there was nothing we could do about it so she had to make do with what she has. Another talent of E showing up.. pwedeng pwede maging event organizer! Sino kayang Daddy ang di magiging masaya sa effort ng anak?! Happy Birthday to M! Have a wonderful celebration!